I’m looking for a TYCO? 8 inch KITTY KITTY KITTENS. 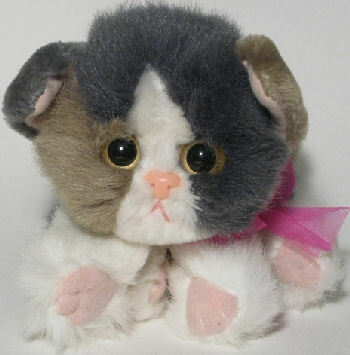 It’s a gray, tan, and white Calico cat with filament whiskers and a pink vinyl nose. There is a ball rolling in the head that makes it sound like it’s purring when you move it. I’ve lost my Tyco Kitty Kitty Kittens. There is one on eBay, but I can’t afford it. My very own was very worn, the fur was not fluffy, her nose was missing, and her balloon in her popped. She was a very beloved item to me, and she’s been with me everywhere. I think I lost her last year while unpacking, but I am unsure. I have been very upset over losing her, and in a tragic turn of events my real Calico cat, Mouse, disappeared last week. I’ve been devastated over all of this. I would love nothing more then to find a replacement, worn or not, for my sixteenth birthday this year (in August) Any help would be loved. Thanks for looking, Chiara, but that’s the starting bid on an auction, not the price. I will pass that link along to Nicole, though, as that’s the one she’s looking for. Molly’s is on eBay right now for $80! Thanks for the help Chiara, but that is not it. I had one of these when I was a kid… I will do my best to find one for you. I doubt I will ever find my childhood bear, but helping other people find their memories makes me feel good. Thank you Yvette for helping. 🙂 I hope this turns out well. He accepted my offer. How’s that for working out haha. Ummm, only problem is, how do I get this little kitty to you? I am not sure how this all turned out for you, but I just came across a kitty kitty kittens today in pretty good shape. She is tan and white/cream and has a hot pink tie around her neck with a pink plastic locket attached which says kitty kitty kittens on the front and inside the locket says “I love my kitty” and a space to put her name. The space is blank so you could add any name you like. and the other side of the locket has her picture. Please let me know if you are intersted.